It was difficult for Concordia to get into any type of rhythm against a strong Laval team who moved the ball effectively, keeping possession for long stretches the entire game. The sound group exploited Concordia’s defence in the first 45 minutes, scoring three goals. Their first goal came just five minutes into the game, when Laval striker Dominique Fortin made good use of a corner to score her second goal of the season, giving her team the early advantage. Despite Laval dominating the ball, spreading Concordia’s midfield out wide and connecting seemingly at will on all their passes, the Stingers were able to retaliate. In the 16th minute Claudia Asselin—who leads the team in scoring—placed a timely header in the bottom right corner that left Laval’s goalie flat footed and the game even at one. 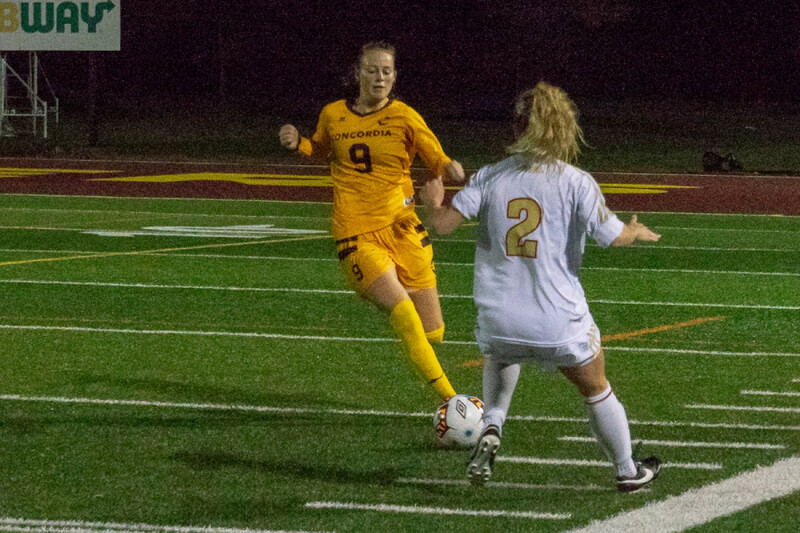 At this point in the game, the Stingers had life and began to play with conviction, but the momentum quickly shifted back Laval’s way after star winger Mireille Patry was sprung by a solid build up in the midfield. It gave her a clean look on goal versus Concordia goalie Olivia Desgroseilliers—who was eventually pulled before the end of the first half—and she did what the Rouge et Or did all night: score. That deflating goal scored just three minutes after the Stingers had equalized not only gave Laval an edge in terms of the score, but psychologically as well. Stingers player Sarah Humes knows very well that in order to beat elite teams, never giving up is crucial. The onslaught continued with Patry leading the way once more, stamping her mark on the night. She collected a game-high three points, scoring two goals alongside a helper in the 25th minute as Laval marched down the field netting their third goal of the half. While the Rouge et Or held a comfortable 3-1 lead heading into the locker rooms, coach Sutton believed his side lacked the extra push to pursue the ball. They were always second to the ball and it hurt them all contest. “We have to be a little bit more reactionary. I think our reactions weren’t too great as well,” said Sutton. In what was reminiscent of the opening minutes of the game, Laval began the second half with a quick goal courtesy of forward Jessica Bunker, who scored her fourth goal of the season in the 47th minute. 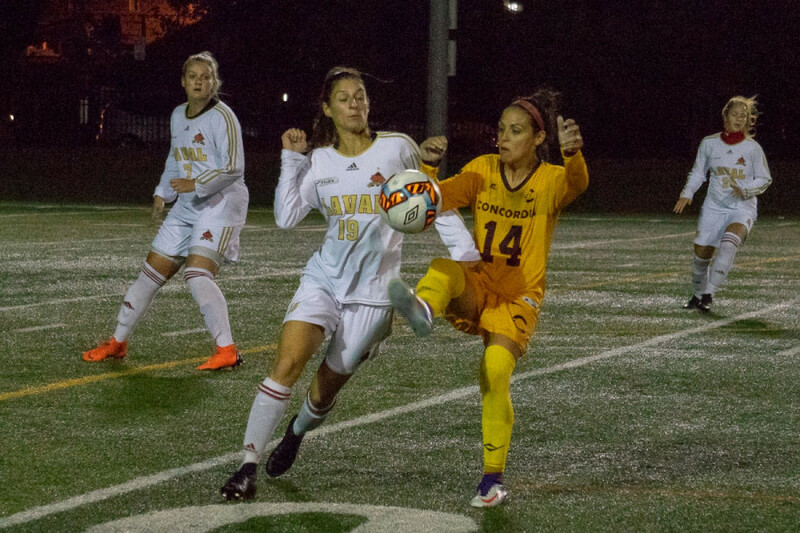 After Mireille Patry had made it 5-1 with a clever play down the right wing, the Stingers were able to answer and deliver a morally important goal in the 74th minute by Sarah Humes, whom expressed her thoughts on what needs to change for the future. Concordia’s experiment of a formation left an inviting hole in the midfield area that ultimately enabled an experienced Laval Rouge et Or attack to gobble up the ball and score their sixth and final goal of the night, with Laurie Couture sprinting past the Concordia defence and tapping in her second goal of the year at the 82nd minute. The tough loss will need to be swallowed relatively quickly by the Stingers, as they will host the third place McGill Martlets Sunday Sept. 23 at 3 p.m. With an overall record of 1-4-1 on the year, Coach Sutton believes adjustments will have to be made accordingly moving forward as the team enters an important phase of the season.